You are invited to our webinar about measurement technology for runway weather detection and how to apply MARWIS in TALPA applications/workflows. Don’t miss out! This webinar is free for all to attend. Once registered, you’ll receive an email notification confirming your attendance for the live webinar. For those who can’t attend the live webinar, the recording will be available to all those who register below. Visit this webinar and you will learn more about MARWIS, the compact, fast and digital sensor that can be mounted on all kinds of airport portal vehicles. It directly delivers the runway condition to mobile devices and stationary outputs such as in a control center (TWR). Therefore, it supports the traffic manager in the patrol car during the runaway assessment without detours. Our expert in aviation, Eric Cottone, will explain how MARWIS gets considerably more information to aviation professionals for their decision-making, automatically retrieving data, thus freeing precious time for the TALPA workflow. 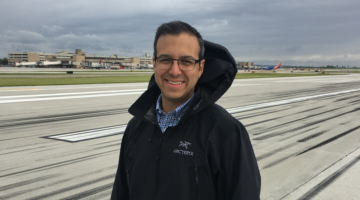 Eric Cottone is our aviation specialist. Eric has been actively engaged in the aviation market for over 5 years. He brings a wealth of knowledge of fixed and mobile airport pavement sensor systems and the requirements of TALPA . Eric is currently participating in the SAE G15 and the ASTM E17.25 Pavement Surface Contaminant Measurement committees to help develop better standards for airport operators to follow when deploying pavement sensors systems and measuring and reporting runway surface conditions.